Familial ties can allow one to stand on the shoulders of giants, or to forever remain in their shadow. Chiara Mastroianni — with those features, with that last name — will hardly ever escape comparison to her legendary parents, Catherine Deneuve and Marcello Mastroianni. Emilio Estevez and Charlie Sheen had to prove themselves against the backdrop of their father’s career, one that included Martin Sheen in Badlands (1973) and Apocalypse Now (1979). Director of Apocalypse Now Francis Ford Coppola is the colossus that his daughter Sofia Coppola has been measured against — at least initially, when she was mostly known for her surname and the unfortunate performance in The Godfather Part III (1990). Yes, Ms. Coppola is the daughter of one famous director and the wife of another [Spike Jonze, Coppola’s husband in 1999–2003], but she is also an assured and imaginative filmmaker in her own right. Her instincts clearly tell her that film is not only a visual medium but also an emotional one, and she is eager to confront the pain, frustration and grief that simmer beneath the tranquil affluence of her enchanted suburb. The success of Lost in Translation meant that Hollywood was ready to invest into Sofia Coppola, and so the budget of her third film was ten times what had been spent on the Tokyo hotel drama: 40 million dollars against previous 4. Marie Antoinette (2006) appeared in the splendour of silk and ruffles, feathers and fans, kitsch rococo and the interiors of Versailles. Coppola’s crew were given an unprecedented access to the Palace of Versailles, resulting in a unique symbiosis between the cast and the historical interiors. There is no sense of accident: floral fabrics and patterns on the walls and sofas compliment the ladies’ dresses and the gentlemen’s coats, the characters and the rooms they inhabit are from the same world. The wigs and curls mirror the festoons of the candelabra, and there is no such thing as too much lace. That is not to suggest that girlish and frivolous comes unaccompanied by somber and tragic. At fourteen, Marie Antoinette leaves her home country of Austria to marry the Dauphin of France, whom she had never met. Her position now entirely depends on her ability to produce an heir — as she is continuously reminded by her father-in-law King Louis XV, her mother Empress Maria Theresa, Austrian ambassador comte de Mercy-Argenteau, and the entirety of the French court. Marie Antoinette is a pretty thing with a purpose, and she will be rewarded or punished according to how well she fulfills that purpose. (Hello, The Handmaid’s Tale.) That is pressure known to the absolute majority of adult women, and, in the protagonist’s position, an inescapable burden. Given that, due to her husband’s inaction, their marriage remains unconsummated for some years, there is nothing to be done but to wait and entertain yourself as well as you can. The young queen shortly becomes infamous for how well she can entertain herself. Sofia Coppola has a talent for giving you the emotional truth, for using just enough strokes to suggest the whole painting. It is worthwhile to compare the historical narrative with the cinematic one, to not treat the latter as factual, but Coppola’s Marie Antoinette was never quite given the time or the reason to grow up. Life is beautiful and full of rules and restrictions, and your only freedom is in the matters which are considered frivolous. Kirsten Dunst is wonderful as the main star of the film. Sofia Coppola’s actress of choice, she had previously worked with the director on The Virgin Suicides and has recently reprised their collaboration for The Beguiled (2017), the forthcoming Civil War drama with a predominately female cast. 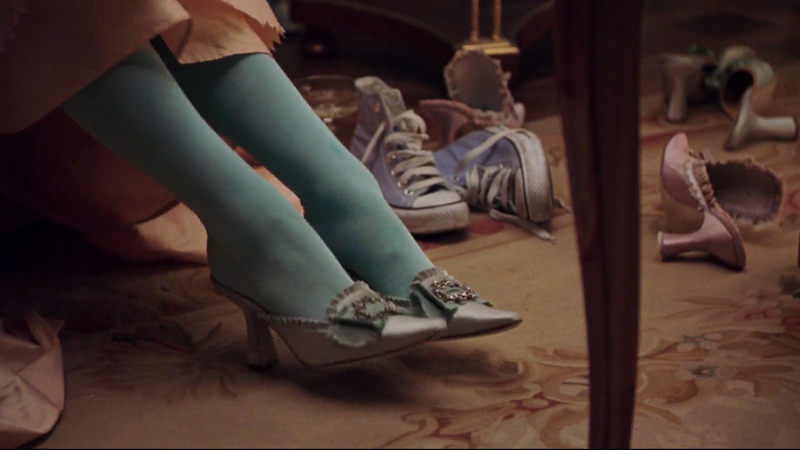 In Marie Antoinette Dunst embodies youth and inexperience, vivacity and an acquired taste for precious entertainment. She is a teenager, and gorging on dessert is her form of rebellion. The film was criticised for not providing enough of a historical background, for having the French Revolution just happen. I would think that is a conscious decision: whether the king and the queen were actually drinking tea on a lawn as the Bastille prison was taken over is irrelevant. It is through the omission of other characters, by surrounding the protagonist exclusively with aristocracy and servants (sometimes, aristocratic servants) that we recognise her isolation and the inability to comprehend what’s happening outside the court. Every criticism I have read of this film would alter its fragile magic and reduce its romantic and tragic poignancy to the level of an instructional film. Marie Antoinette remains delicate throughout; it knows that we know what’s to come, and so stops short of the tragic finale. Here is a black scarf tied across the queen’s throat, as a suggestion of something much more sinister. Here is a sunset, here is her saying good-bye. What happens then is an entirely separate story. The famous saying about cake made it into the film: Coppola plays around, pointing out that Marie Antoinette had never actually said that, but providing enough images of pastries to preserve the connection. I love eclairs; should it be a wonder that I loved this?